Does the Magic Formula Produce Enchanting Returns? Since the U.S. Value Direct Composite portfolios are apparently about equally weighted, RSP is a more suitable benchmark than the capitalization-weighted S&P 500 Total Return Index presented at Formula Investing. Because the CompuStat database includes many more stocks (with smaller market capitalizations) than the S&P 500 Index, the “magic formula” may tend to select relatively small stocks, and we also consider IWM as a potentially relevant (though capitalization-weighted) benchmark. 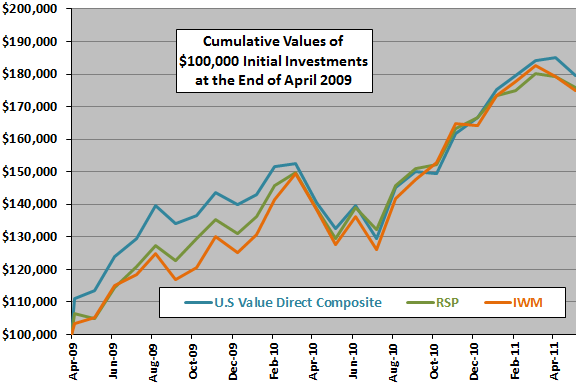 The following chart compares the cumulative values of $100,000 initial investments in the U.S. Value Direct Composite, RSP and IWM over the available sample period. Outcomes are not much different for the three series. The early lead of the U.S. Value Direct Composite comes entirely from its inaugural-month outperformance, which may represent a lucky start. In fact, starting the contest at the end of all of months May 2009 through March 2010 puts the “magic formula” in third place at the end of June 2011. For another perspective, we look at monthly return statistics. 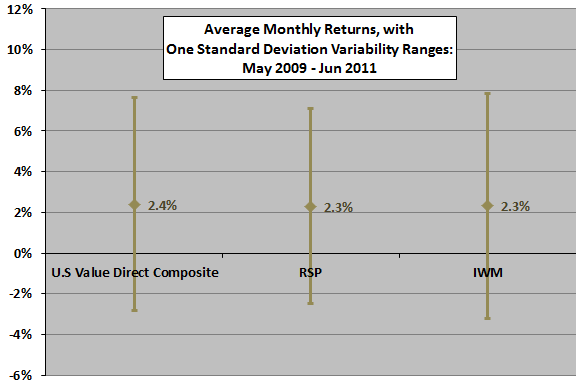 The next chart shows the average monthly returns, with one standard deviation variability ranges, for the U.S. Value Direct Composite, RSP and IWM over the available sample period. 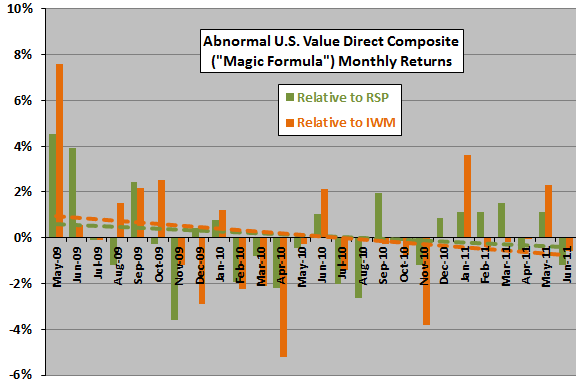 Statistics are similar for the three series, with RSP and IWM having slightly lower average monthly returns than the “magic formula” and RSP (IWM) having slightly lower (higher) return volatility. Excluding the first month of the sample eliminates the average return edge of the U.S. Value Direct Composite. What is the trend in monthly performance of the U.S. Value Direct Composite relative to RSP and IWM? The final chart tracks the monthly returns of the U.S. Value Direct Composite minus same-month RSP and IWM returns over the available sample period, along with color-matched dashed trend lines. Results show that, with the first month of data included, abnormal performances of U.S. Value Direct Composite relative to RSP and IWM both decline. Excluding the first month eliminates the downtrends but also eliminates any indications of outperformance over the sample period. In summary, evidence from simple tests on a limited sample does not support a belief that the “magic formula” outperforms reasonable exchange-traded fund benchmarks in real use. Given the frequency of portfolio reconstitution and the rate at which stock selection indicators change, the sample is very short (only about nine quarters) for reliable testing of the “magic formula” valuation methodology. The sample includes no bear markets. There may be some other benchmark more suited than either RSP or IWM to the actual portfolio weights and distribution of market capitalizations within the U.S. Value Direct Composite.